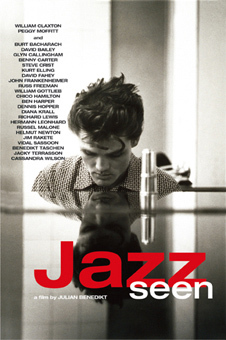 Jazz Seen is a feature-length journey through decades of American entertainment history and the remarkable life and talent of jazz photographer William Claxton. The film focuses on the man whose eyes have seen images of people we have all grown up with: film stars, jazz musicians, top models, icons of the American dream. Claxton started his career in the early fifties with a photograph of a young Chet Baker, who became a role model for the young rebels of that time. Claxton captured the moments when a young actor turned into Steve McQueen, an elderly lady into Marlene Dietrich, a saxophone player into Gerry Mulligan. The style of the film is very personal, a mix of interviews with celebrities who recall working together with Claxton including Chico Hamilton, Burt Bacharach, Russ Freeman, John Frankenheimer, Dennis Hopper, Helmut Newton, Vidal Sassoon, and many others. Julian Benedikt was born in 1963 and studied French and German at the Sorbonne in Paris as well as Classical Music (flute and saxophone) in Detmold and Frankfurt. He worked as an associate producer for advertising films, documentaries and feature films in Germany, France and the US from 1985 and also appeared as an actor in films by Rudolf Thome (Love At First Sight, 1992), Roseline Delacour (High Tension, 1994) and Dodine Herry (Je n'en ferai pas un drame, 1995) and for television in Cognacq - Jay for the cultural broadcaster ARTE in 1993. He has written and directed the documentaries Chico Hamilton - Dancing to a Different Drummer (1993/94), Voodoo Chile - The Music of Jimi Hendrix (1995), Blue Note - A Story of Modern Jazz (1996) - winner of the C.I.C.A.E Award for Best Film in 1997, as well as the Vision Award and the Peabody Award in 1998), and Jazz Seen (2001).